Book and return address labels for kids and the kids at heart – cartoony and fun. Need to label all your kids school books, items or your own stuff? Perhaps you have a ton of envelopes or packages to mail out and don’t want to spend ages writing on each and every one. The solution is to quickly create your own labels using our fun designs. Add personality (and colours that will get noticed) so your kid’s items will find their way back home. I have put together a growing collection of labels and sticker that can be easily customised with your own text to make a fun solution that will replace hours of writing on items with a quick way to id all your things so they can find their way back home. 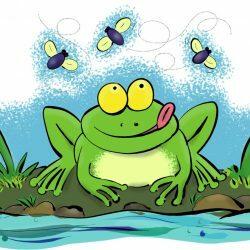 From funny chicken cartoons to cute whales and dolphins, frogs and more, check out our collection below. Cute customisable school stuff to make learning more fun! With the new year already in full swing and school days not far away it’s time to get ready for class! I have put together a collection of customisable school items including pencil cases, binders, lunch boxes and bags to make school fun and interesting. Kids will love these designs on their items. Add their name for identification and make it both original and special.